Feeling overwhelmed, stressed, and scattered? Are you caught up in the busy, the messy, and the disorderly? What if you could open up space for more abundance and clarity? Find real, sustainable happiness with less by decluttering your life, uncovering joy, and saying goodbye to distractions. The process of simplifying my life helped me clear through the mental and physical clutter, manage my stress and anxiety, boost my productivity, and find more peace. I want to help you do the same, so you can feel confident, courageous, and capable to design your most fulfilling life. Minimalism isn't about depriving yourself of the things that bring you joy. Minimalism IS about being more intentional with what you allow into your physical and mental space. It’s about editing down your life to create abundance in the areas that matter most. It’s surrounding yourself with the people, things and experiences that ignite your spirit. It's the act of simplifying. Introducing the Simplify & Thrive Guidebook. The Simplify & Thrive Guidebook gives you a starting point, a clean slate, and a new way of thinking, so you can take the tools and apply them to your own life. I found my truth and I want to give you the tools to find yours. This guidebook is packed with information, resources, and interactive exercises designed to help you create your own ideal version of simplicity. Each chapter builds off the other and creates a personalized guide for what you want and need to amplify your happiness. ✓ Boost mental clarity and productivity. ✓ Say goodbye to unnecessary distractions that are clouding your focus and draining your productivity. ✓ Uncover systems that promote real, sustainable happiness. ✓ Find greater fulfillment through decluttering spaces, reducing waste, and re-examining your attachment to material things. ✓ Reduce stress and find true meaning with less. I created this guidebook for YOU, so you run the show. You’ll find 40+ pages packed with content, resources, tools, and personal realizations. 40+ pages of actionable insight into simplifying 6 core areas of your life. Step-by-step guidance on what to do, why it's important, and how to make it a reality. Interactive workbook exercises, journal prompts, and checklists to help you take action. Weekly Budget Tracker template to simplify your finances. Access to the Simplify & Thrive Community on Facebook to find accountability and support along this journey. 25+ resources for further exploration into the world of simplifying. "I'm so impressed with how much valuable information was packed into this guide. Not to mention, it's so beautifully designed. This guidebook was the perfect deep dive into simplifying core areas of your life, and it's laid out in a way that is not intimidating. These practices are truly life-changing, and it has made such a difference in my mindset. It feels like the beginning of fresh, clean slate." Who is Simplify & Thrive for? 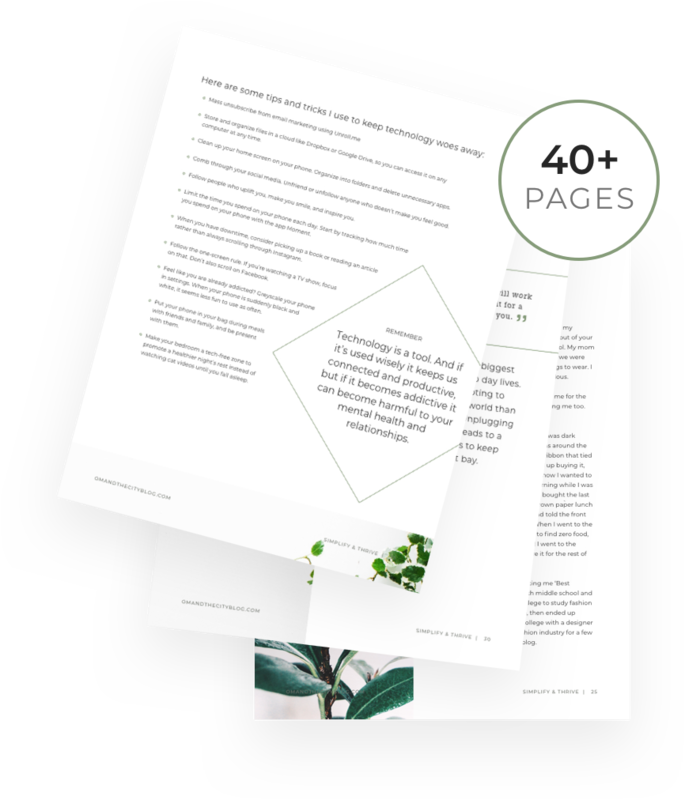 The Simplify & Thrive Guidebook is perfect for anyone looking for inspiration, insight, and actionable steps to get started on their simplifying journey. How do I get my hands on the guidebook? Upon successful purchase, your copy of the Simplify & Thrive will be delivered right to your inbox as a digital PDF for download. How do I use the guidebook? Type all over it. This book is meant to be consumed digitally, and there are spaces where you can type, answer questions, and then save it. Prefer to handwrite? Use your own journal to write out exercises as you read it. How long will it take me to complete the guidebook? That’s entirely up to you! Simplify & Thrive is completely self-paced so you can complete it in the amount of time that feels right for you. Read a chapter a week and focus on that area of your life for the month or do the entire guidebook in one week, your call. You can always go back. If you need to rethink or redo a section, go for it! This is not a “fix-all,” simplifying your life takes time. Let it sink in mentally before you execute it physically. And remember to enjoy the process! You might uncover some new things about yourself along the way. Due to the electronic nature of this product, all purchases are final and no refunds will be available. The creator behind Om & The City where I share real, actionable insight on everyday wellness empowering you to simplify your life, invest in your wellbeing, and tap into your highest self. By bringing holistic wellness down to Earth, I help you design your most fulfilling life. I created Om & The City back in 2014 to share my raw and ever-evolving wellness journey, while giving women the inspiration to take action in their own lives. Through exploring my own challenges, I kept coming back to the idea of simplifying and letting go of what does not serve me, because I realized simplicity is the key to… well, life! It is the key to managing my anxiety, stress, and feelings of overwhelm, making me a happier, more peaceful human, so like I said… it’s the key to LIFE. Since I started simplifying, my focus, productivity and creativity multiplied. I work smarter, I feel calmer, and I am able to live in true alignment with who I am. In the Simplify & Thrive Guidebook, I share with you the truths I found, so you can also feel ignited with joy to create significant change where it matters.